By command of H.R.H. the Prince of Wales, Grand Prior of the Order, the Council of the Order of St. John of Jerusalem in England intimate that Her Majesty has been graciously pleased to authorise the issue of Service Medals to reward Distinguished Services and to encourage efficiency and long service in the various Departments of the Order. Members of the Brigade who have performed distinguished services, or have served honourably and efficiently for a period of not less than fifteen consecutive years, will be eligible for this medal. Throughout its history the Service Medal has been awarded for conspicuous service of different kinds to the Order, not exclusively for length of service. 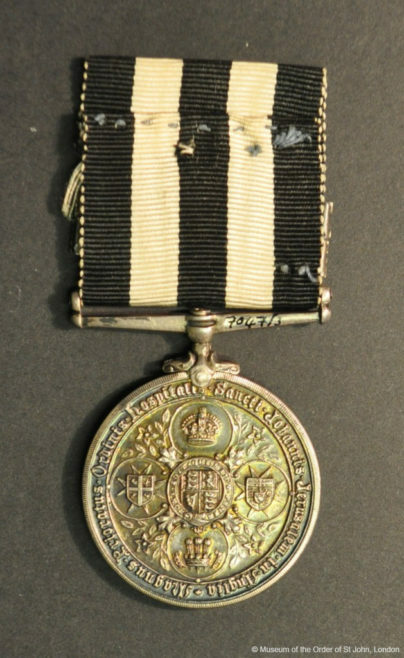 For this reason, it should not be referred to as a long service medal, although its most common use is to reward long service in St. John Ambulance. The normal qualification was 15 years efficient service in the United Kingdom and 12 years in the Priories of Australia, Canada, New Zealand and South Africa. In any other overseas territory it is 10 years. The qualification period in the UK was reduced to 12 years in 1990. Each additional 5 years of service is recognised by the award of a silver bar to be worn on the ribbon and, for a long period, it was possible to achieve a large number of these bars which made them difficult to fit on the ribbon. This problem was solved by the introduction of gilt bars. When 20 years additional service has been performed the three silver bars are removed and a single gilt bar substituted. 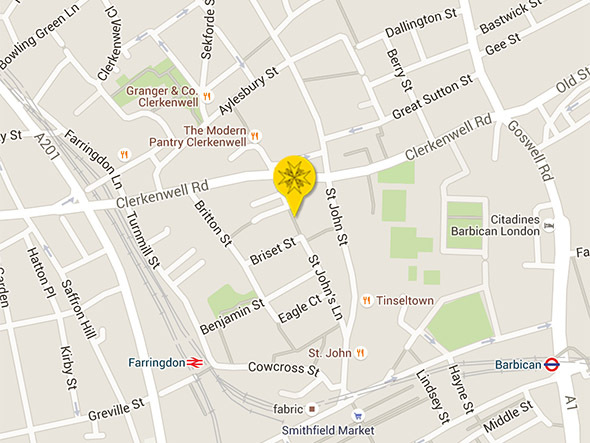 Additional periods of 5 years of service are recognised by further gilt bars. As this medal has two silver bars, it is possible to say that Mr Ralphs was with St John Ambulance for a minimum of 25 years. Until 1942, the medal would be issued with the medal number, rank and name of recipient, unit and year of award. Following the Second World War this practice was abandoned, except by a few Districts that made their own arrangements for a brief period. This Service Medal reads ‘331 ASST COMMR E. RALPHS HONG KONG DIST. S.J.A.B.O 1925’. Service Medals were awarded to members of divisions around the world. With one small exception, the design of the Service Medal has remained constant throughout its history. The obverse features the head of Queen Victoria, modelled from a bust carved by H.R.H. The Princess Louise, Duchess of Argyll. 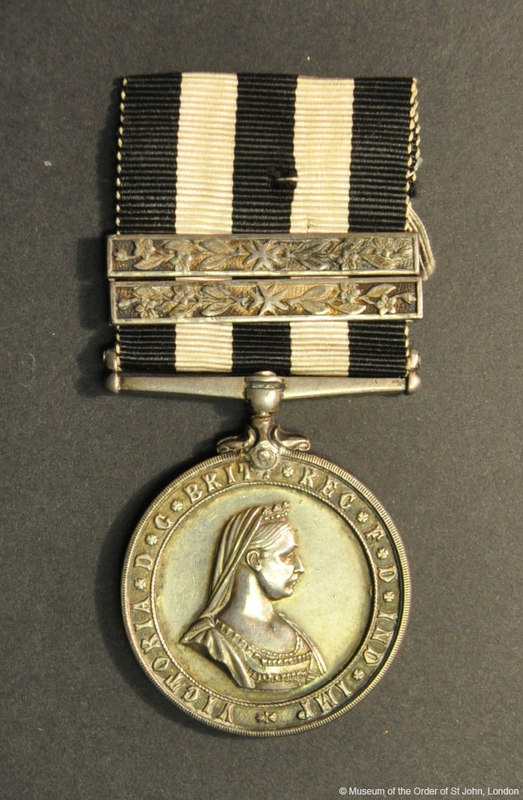 The Service Medal is the only British medal to retain the head of Queen Victoria on a current issue. The reverse of the medal, between sprigs of St. John’s wort, contains five circles showing the Imperial Crown, the Royal Arms, the arms of the Prince of Wales as first Grand Prior under the Charter of 1888, the crest of the Prince of Wales and the pre 1926 Arms of the Order.